As the production of The Witcher Netflix series is in the works, and Henry Cavill is set to star as Geralt of Rivia, fans are looking forward to seeing what’s in store for them. In a post on the netflixwitcher subreddit, user gravemaster7 shared a screenshot from the website of Morwenna Preston Management, coates’ acting agency. 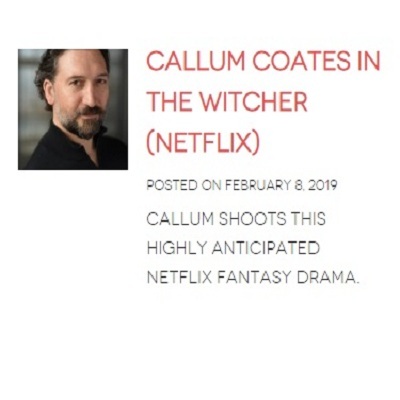 In the image, we see a photo of the actor with a caption that says Callum Coates in The Witcher (Netflix). Although we have no information on what role will Coates be playing in the series, Witcher fans have begun speculating as to which role Coates might be playing. One Reddit user by the name of Yslyven mentions getting Borch vibes: from the image of the actor, while also saying that it is possible that they may see him a mage (Dorregaray) or a noble attending Cintra Banquet. We will keep you posted on further development.